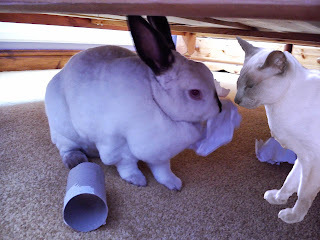 Speedy the cheeky house bunny: A visit from my Fun sweet friend Nellie! A visit from my Fun sweet friend Nellie! Today I had a fun visit from my Friend Nellie from Cat from Hell ,I met her at the door all excited,I love Nellie and love it when she comes to visit me,cause she's great fun! first we played in the garden while mummy cooked Nellie her favourite dinner Tuna fish cakes and salad for my dinner. Then we played chase around the house and ended up in my favourite play spot under the bed!it's Nellie's favourite place too! 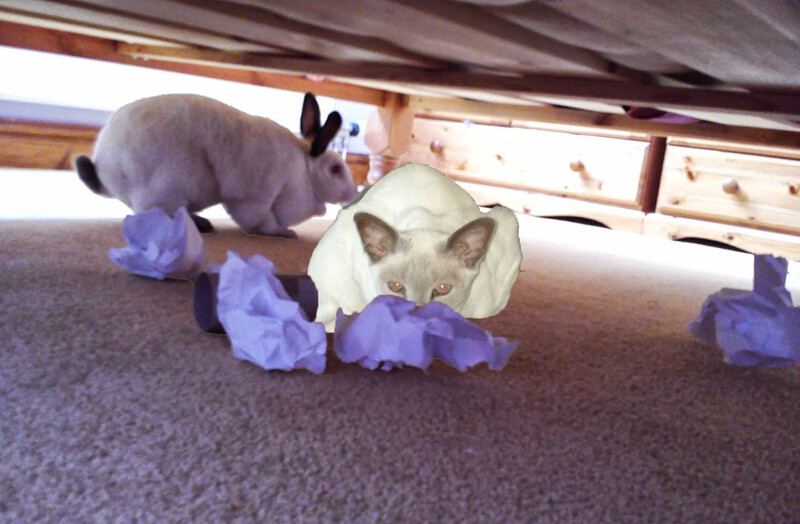 Followed by playing with my paper and shredding it all up,we made a bit of a mess under the bed but mummy didn't mind!She said as long as we had fun it was OK! Isn't mummy great for not minding!I wish Nellie could have stayed She's just fun to have around and great for snuggling up to too!But she had go and visit her Pal Austin! Come Back soon for another visit Nellie! And then Somebunny else came to Visit 3 somebunny else's infact right after Nellie left the closet door opened with 3 bunnies peering round the door! You can read all about this furry group of travellers tomorrow! 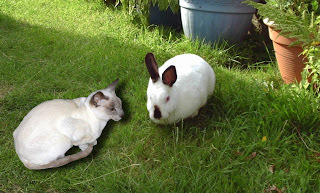 Wow Speedy, I would never dare playing with our neighbours cat. She shows teeths and claws.... Nellie must be a very friendly cat. Love the "paperwork" you did together. (Guess what... I have a new piggy friend myself who will stay furever. Mom should keep the blog up to date, I tell her! What fun for you Speedy. You and Nellie sure make cute furends. Have a wonderful Wednesday. What a fun time you and Nellie had, Speedy. Those tuna cakes sound delicious! Looks like you two had a blast playing in the garden and under the bed. The two of you look so happy together, real best friends! Thank You so furry much me had the bestest time! So good, that mes sleeped past the time to makes my post! Me can't wait to comes and visit yous again! Me is so furry lucky to has a bunny furrend like yous! What a fun, fun visit you had and we love that Nellie too! Oh Speedy! We love Nellie! How fun that she visited you. Oh Boy! Speedy you must be the bravest Bunny in town to have a friend that is a C.A.T !!! Looks like you both had a lot of fun. That looked like so much fun!! Just a quick update on Speedy's eye! More photo's from this week! My poor baby boy Speedy! Inspiring blog award form Selina!